Fall is almost here. And along with breaking out our boots and sweaters, most of us will mark the changing of the season with a vigorous attempt to avoid the inevitable cold and flu outbreaks by washing our hands a lot to stave off germs. While the vast majority American consumers may prefer antibacterial soap products (at least according to this 2011 cleaning industry poll), a team of researchers at Korea University, Seoul found that antibacterial soap made with the common antibacterial and antifungal agent triclosan was no better at killing germs than regular ol' soap in both lab and real world experiments. The researchers found that there was no significant difference between a soap that had triclosan and the very same soap formulation without it. Instead, both versions of the soap killed 20 common, dangerous bacterial strains in a lab setting at about the same rate. And in a real-world experiment, both versions of the soap similarly rid hands of the harmful bacteria, Serrate marcescens -- a pathogen responsible for urinary tract infections and wound infections. 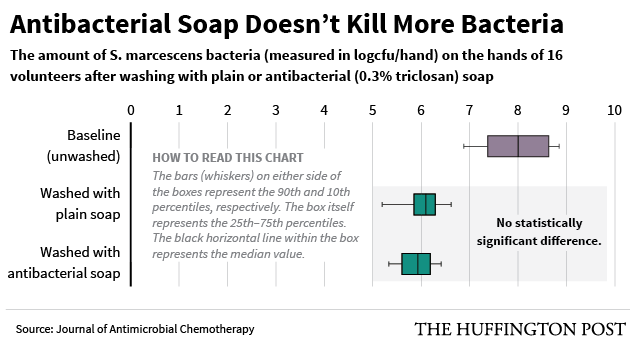 "Triclosan in soap does not always guarantee higher antimicrobial efficacy during hand washing," lead researcher Min Suk Rhee told The Huffington Post. "It is more important for consumers to wash their hands correctly and frequently rather than to use the antibacterial soaps containing triclosan." 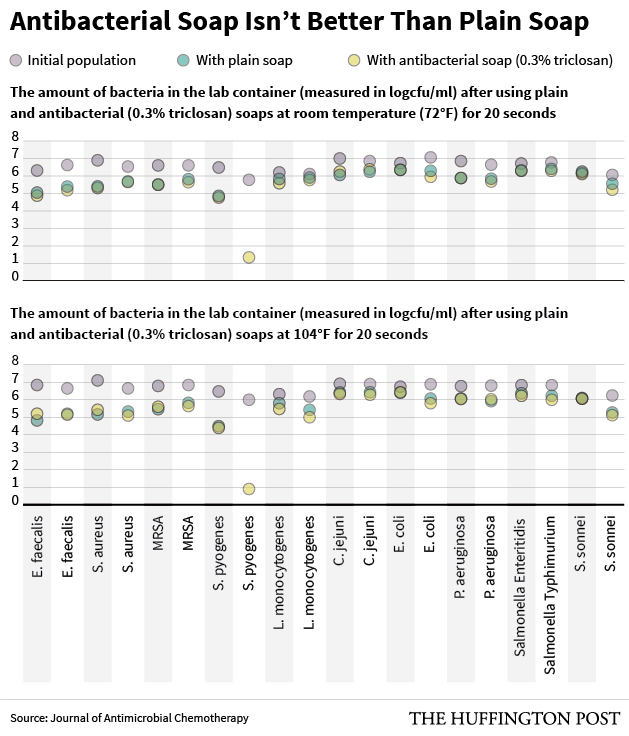 To test whether triclosan in soap is more effective than plain old soap and water, Rhee first exposed 20 different strains of bacteria to the two different formulations in a lab setting. The soap was heated to 72 degrees and then 104 degrees to mimic both room temperature and warm water, and was exposed to the different bacteria for 20 seconds at a time (about the time it takes to sing “Happy Birthday” twice, or the recommended amount of time needed to wash one’s hands). Rhee found that the antibacterial soap was no better than soap and water when it came to eradicating most of the bacterial strains. In a real-world use experiment, Rhee then exposed 16 healthy participants to S. marcescens by dipping their hands in a bacterial solution. They were then instructed to wash their hands with either the antibacterial soap or the regular soap. Afterward, samples of the bacteria on their hands was taken and cultured to see how much of the S. marcescens remained. Like the lab study Rhee performed, this in-person experiment found again that the antibacterial soap was no better than the regular soap. There are two important caveats to Rhee’s findings, but they actually underscore the uselessness of triclosan antibacterial soap even more. Firstly, the antibacterial soap did end up killing some of the bacteria faster than the soap and water in the lab experiments — provided that it remain exposed to the bacteria for at least nine hours. Who do you know who washes their hands for nine hours? Secondly, soaps with triclosan were much more effective at killing germs than regular soap and water when the soap had a triclosan concentration higher than 0.3 percent — more than the legal limit soaps are allowed to have. Triclosan has been in consumer cleaning products for over 30 years, and this isn't the first time experts have raised concern about certain antibacterial soaps. The U.S. Food and Drug Administration put the soap industry on notice back in December 2013, when they proposed a new rule that companies must demonstrate that washing with antibacterial soap is more beneficial than regular soap and water. The FDA also called on manufacturers to publish more safety data in light of new evidence that suggested there may be some risks associated with the antiseptics. For instance, while triclosan is not currently known to be hazardous to humans, its use has been linked to adverse effects like antibiotic resistance, endocrine disruption in animals and toxicity in certain types of aquatic life. In response, Rhee wrote in his research, most soap manufacturers have simply pulled triclosan from their antibacterial products; according to a survey Rhee performed in July 2014, only 13 out of 53 antibacterial soaps still contain triclosan. But there are still some triclosan products on the market, and not all consumers and advertisers have gotten the message about triclosan, Rhee writes. For instance, while most companies are quietly removing the agent with little fanfare, triclosan is listed as an active ingredient in Ajax antibacterial handsoap, Colgate Total toothpaste, Tea Tree Therapy antibacterial soap and Kleenex antibacterial foam skin cleanser, among others. The study was published in Journal of Antimicrobial Chemotherapy.